"You see, we live in the biggest pimplecreamcrisis since 1967..."
Same as it ever was... same as it ever was. "Once in a Lifetime" is the first DMOD by Simeon, the author of two more mods including the epic "World of DinkC," which is one of the few post-2001 DMODs I've actually played before. I wasn't a fan back in 2006, but I'll talk about that when I get there. This one was an amusing 40-minute quest that passed in a pleasant way, even though I was never sure of what was going on or why it has that title. It seems that some people have been forced off of half of the island on which they reside by a bunch of monsters; the only explanation you ever get for this is that a giant pillbug did it. Okay. The plot is incredibly standard DMOD stuff, Dink's involvement coming about because he's sent to the island on a boat by King Daniel. Still, it won some points with me for being highly silly throughout without lapsing into total incoherence. The tone of this mod is so happy-go-lucky that even when I found the diary of a doomed man trapped by the oncoming monsters, it didn't move the needle on the mood of things even a little. There's quite a bit of optional stuff here. 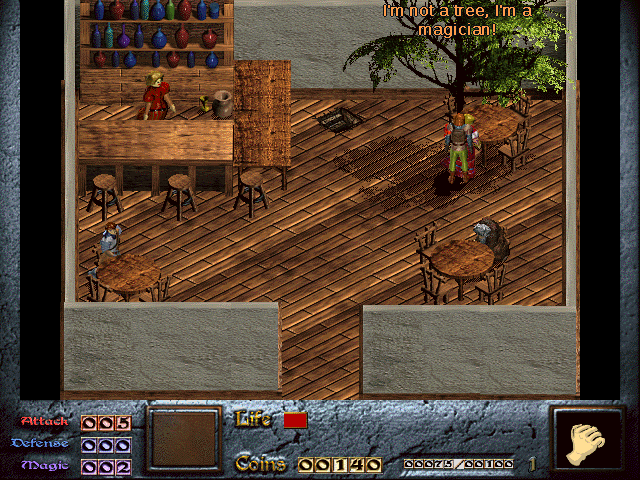 There are little red sparkles called orbs strewn about - I immediately thought of Quest for Cheese, but it's actually not much like that. Whereas "Cheese" hid its pixy poops quite cleverly, the orbs are not so much hidden as they are a reward for being thorough and paying attention. In the end, they don't do anything but determine how good a set of powerups you get near the end, and it doesn't matter anyway, because the giant pillbug is a pushover. 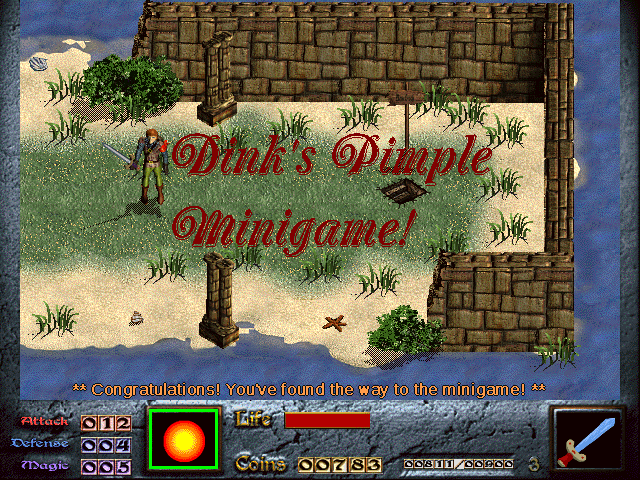 Of more interest: by going out of your way and solving a puzzle, you can unlock something called Dink's Pimple Minigame, an even sillier DMOD romp where Dink seeks pimple cream and to defend a village from invading goblins. 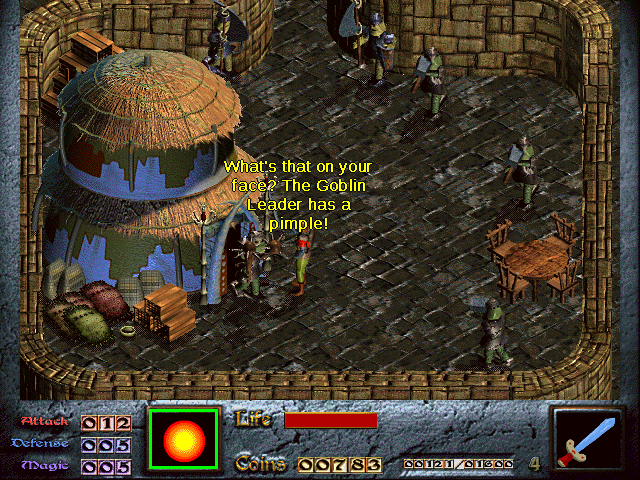 It turns out that the goblins are only invading because their leader also suffers from an ugly blemish, and they don't have any pimple cream either. It doesn't get much sillier than this. If I had to describe "Once in a Lifetime" in one word, it'd be 'agreeable.' It wasn't by any means great, but I've got nothing bad to say about it except that the story was a hardly-there mess, which didn't bother me terribly given that it took less than an hour all together. You could do a lot worse than to play this one.